So today, my son and his friends went to an indoor water park. It is very interesting riding in a car with four boys and what they talk about. For 20 minutes I listened to them discussing their new names...one of my favorites...Nemo Shamu. Cute, huh? As I sat at the water park, I got a new TPT pack done. I love it. It is for Easter and it reviews some of the FOSS vocabulary that the students have used in prior units. I wanted something that didn't cost much...some eggs, plastic Easter eggs (got a ton in my basement), and solvents around the house. I figure kids could bring in some liquids if they wanted to add to what I would bring in. I love the peep idea, but I wanted it to be relevant for my students after finishing the variable and mixtures and solutions units. 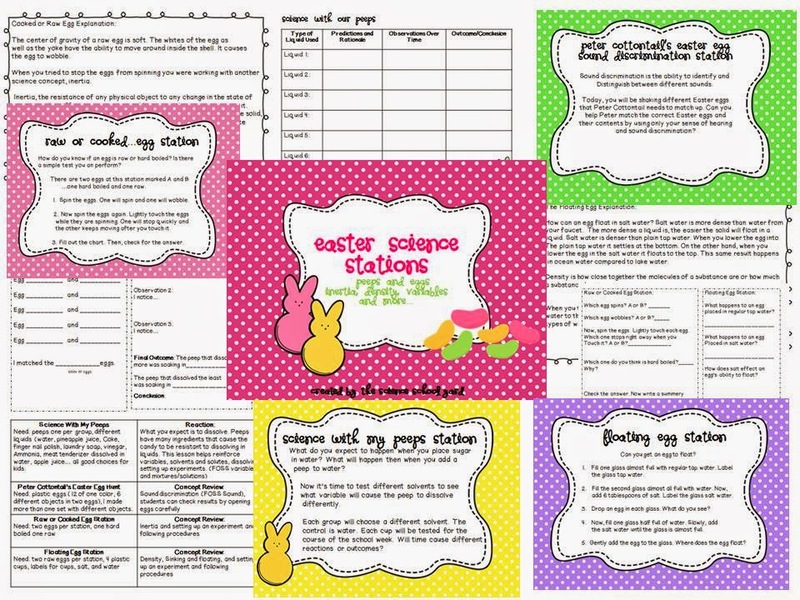 Check out my new Easter Science Stations... I can't wait to share them with my students and you!